Escalated Events - Get the Party Started Right...Now. Wow your best friend, sister or sister-to-be with elegant, shimmering, professional grade bachelorette decorations. We meticulously inspect, monitor and perfect every decoration, ensuring your celebration of fun kicks off with ease. Want to go down in bridal party planning history? Order these. Seriously, she'll sincerely appreciate how it looks like you poured in a ton of effort, and you'll secretly smile, knowing you made your friend happy, without hours of decorating, or breaking the bank. Extra-thick, long-lasting, shimmering gold letter BRIDE balloons add a pop of classy fun to any bachelorette event. Simply fill, string, tie and appreciate the spectacular results. 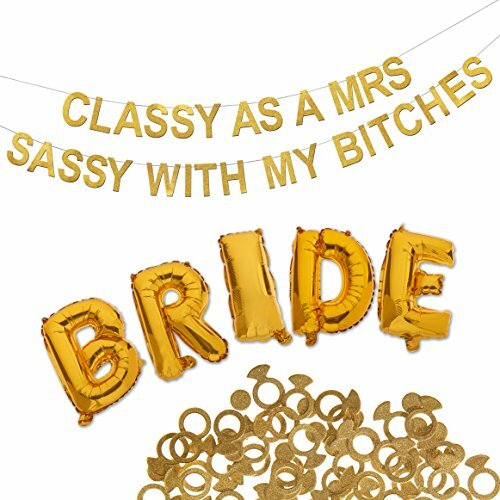 Pre-strung "CLASSY AS A MRS, SASSY WITH MY LADIES" banner instantly draws attention, turning awkward introductions into smiles while setting the mood, for a fun, high energy, friendship building bachelorette party your bride is sure to enjoy. Don't let dull, dark or bland spaces spoil your dramatic effect. Simply sprinkle about this golden rings and circles confetti to enhance and reflect sparkling radiance around your dimmer, darker spaces.  FASTEST, EASIEST SETUP - SPECTACULAR BACHELORETTE PARTY RESULTS: Don't waste time shopping for individual bridal shower supplies. Elevate her bachelorette party with elegant, shimmering, PROFESSIONAL QUALITY bachelorette party supplies SET UP IN MINUTES, yet LOOK LIKE YOU SPENT DAYS finding. The bride will thank you!  WOW EFFECT - FULL 3 PIECE BACHELORETTE PARTY KIT: Simply hang the pre-strung CLASSY AS A MRS, SASSY WITH MY LADIES Bachelorette Party Banner, inflate BRIDE Gold Foil Balloons and sprinkle around gold confetti RINGS and circles to add classy flair and pop to your party space.  BREAK THE TENSION - KICK OFF THE FUN: Bachelorette Party Package helps break the awkward silence and SET A FUN MOOD - the ultimate shower party decorations to get the party started right now.  SHIMMERY & THICK - NOT CHEAP LOOKING: Our eye-catching bachelorette banner set, balloons and confetti radiate and reflect SHIMMERING, BEAUTIFUL light that enhances any space - the perfect way to get naught and say, "Lets Party Ladies"
 100% SATISFACTION GUARANTEE - LOVE THEM OR YOUR MONEY BACK: We guarantee you'll feel 100% THRILLED with how well these GORGEOUS decoration bachelorette party supplies STAND OUT and INFUSE CLASS into your pre wedding event or simply let us know and we'll provide a full refund or exchange, whatever makes you happiest! If you have any questions about this product by Escalated Events, contact us by completing and submitting the form below. If you are looking for a specif part number, please include it with your message.